It makes you wonder just how many more of these collects there are hidden around the world just waiting to be found and and lovingly restored. Glad I've got and English must admit, I am tempted. The collection looks great. Seems quite sensible - Macao was a Portuguese colony back in the days. Good place to rent Portuguese Mokes I guess. Will I have enough loot left after my house 'restoration'? OK, someone had to say it - were the Chinese worried about bonnet toggles failing?????? shut up Jan!!!! go to bed!!!! We had over 30 (maybe even 34?) Mokes at the fabulous National in Falmouth, Cornwall last month, and I think we may be heading for 22 maybe 23 plus at the Welsh Weekend in just over a weeks time! 25 at L2B this year!!!! It's been a very good year event wise! Ok I should amend that to the USA where Moke's aren't factory built here. 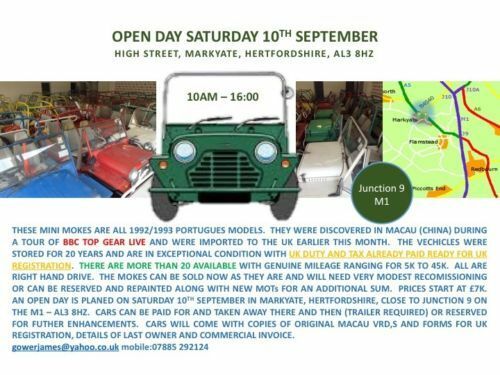 Well it was a long night but the upshot is that there's now one less Moke in the showroom and its back where it belongs, oop north, and once it's been recomissioned it'll be back on the road. Many thanks to james, stopping up late to receive us and giving us free reign to look/drool/pick from the collection.....and then play musical Mokes getting one out! Seems you had a long night Nigel!!! Well done! Photos of your purchase? (when you've had some sleep!). Does it need much work? Congratulations on your new purchase Nigel. 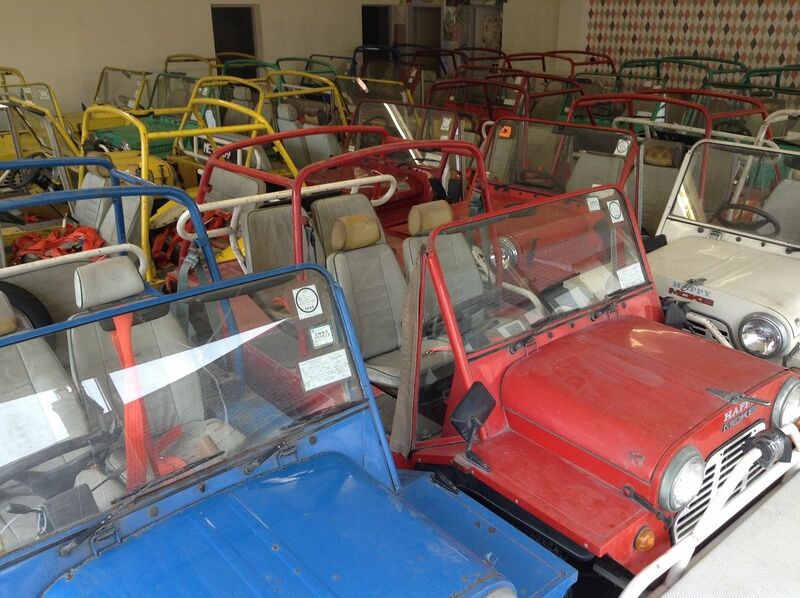 These Mokes are located less than 10 miles from me in Markyate and I went to see them last week. 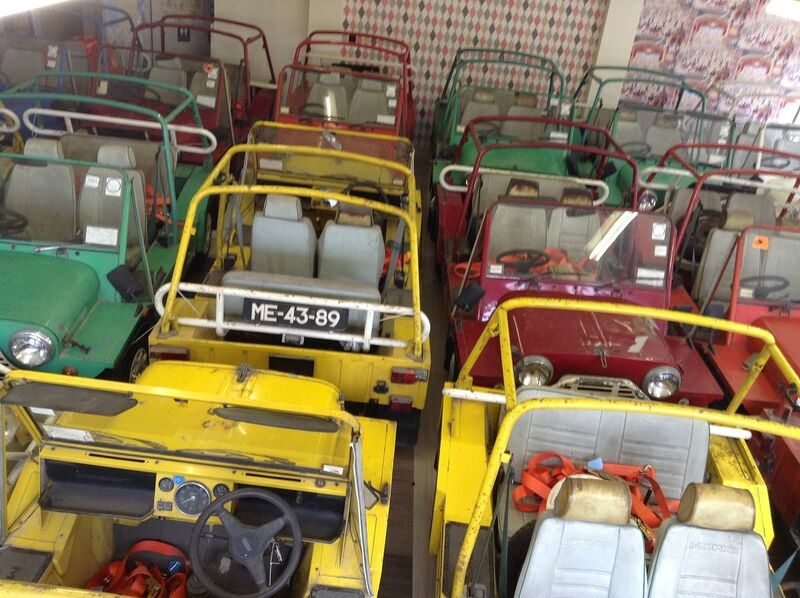 Although some are a little rough around the edges, I think they are remarkably solid for Mokes that are 25 years old. I think he is asking the right sort of price for them too. It is unfortunate most of the bonnets have been dented by people sitting on them and none of them come with hoods. James is having an open day on Saturday 10th September and I wouldn't be surprised if it gets a bit crowded. James told me that he has already sold two or three. Which colour did you buy? I went to see these Mokes 25 years ago when I was visiting Hong Kong on my travels and I popped over to Macau for the day. Happy Mokes originally had 43 on their fleet and I have been wondering what happened to them ever since they were offered for sale in 2006. Micke Pettersson originally found the details and posted them on this forum here. 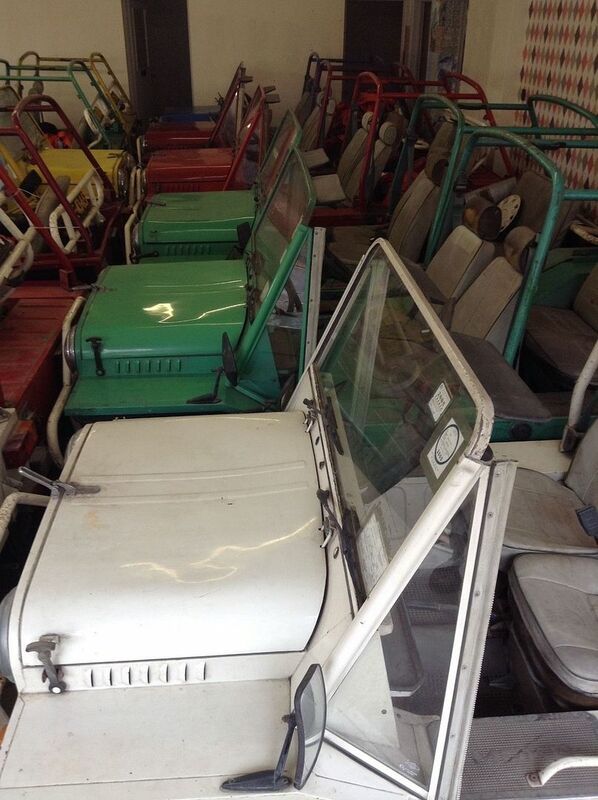 I have some other photos and may even have a photo of the Moke you have bought. This really has to be the last cache of Mokes like this to be discovered. But then we have said that before and yet they still keeping turning up don't they?